How many "free" credit cards do you have right now? How many times has somebody on campus or in your mail tried to push a "free" credit card on you? Well, it is. But before you fall for the easy offers, consider all the following consumer traps lurking within the ant print of most credit cards pushed on students. After a little study of the following gimmicks, you might want to walk away from the next person (or mailing) offering another card. The disappearing low introductory rate. Most cards offer a low introductory rate only for a limited amount of time. That introductory rate may apply only to the "balance transfers" they want you to make or it may apply also to new purchases. But at the end of the intro period, that interest rate will rise—and that higher rate will then be applied to outstanding balances. That long-term rate, which must be disclosed at the time of the offer, may be higher than your current card. Annual fees and balance transfer fees raise the effective interest rate. Though they may offer a low introductory rate, many cards charge either an annual fee or a balance transfer fee or both that effectively raise the interest you are paying. If you pay a $35 annual fee and a 2.5% balance transfer fee on a transfer of $1,000, for example, you have just added 6% APR to whatever rate you agreed to pay. Higher interest rates for cash advances and new purchases. Checking the small print of most credit card offers reveals that cash advances never receive the lower introductory rates. Instead the rate for cash advances on many cards is as much as 19.9% APR or higher. Ouch! Many cards also charge the higher interest on any new purchases (beyond the balance transfer or initial "convenience check") made even during the introductory period. 0% that isn't really zero. Some companies are now offering rates of 0% on balance transfers that last until the transferred balance is paid off. Sounds good, but there can be several catches. First, there's often a transfer fee of typically 3%. Next, to keep 0% on the balance transfer, you have to make a minimum of new purchases which are charged the regular, higher APR. Finally, make a payment late and 0% disappears, replaced by a much higher rate. Most card companies no longer offer grace periods for payments. If the payment arrives even a day late, a late fee is charged. The average fee these days is $29-$30. Some companies are even time-stamping payments—the statement says the payment is due on a certain date; the fine print says it has to arrive by a specific time, usually noon or 1:00 PM on that day. If your payment arrives on the due date but in the 3:00 PM afternoon mail delivery, let's say, that's too bad—you'll be charged that $35 late fee. Late fees and other penalties now account for a sizable portion of credit card company profits. Astronomical "penalty" APRs after a late payment. If you pay after the due date by even a day or two, some card companies then increase the interest rate on the account dramatically. Miss the due date once and your rate may skyrocket to 19.8%, for example; miss it twice with this same company and the rate goes to 25.9%. That increased rate is your new rate from that point on. In addition, the company adds fees such as $29 or $35 for each late payment. Lower interest rate balances are paid off first. If the balance on the card was accumulated at different times—for example, a balance transfer at a 4% intro rate, new purchases at 15% and a cash advance at 19%—the card issuer applies your payment first to its fees and the lower interest balances. You continue to rack up interest on the higher rate balances. The big print may say that the card offers a 25-day grace period on new purchases before interest starts to accrue. The small print says that if the card carries a balance (if you don't pay it totally off every time), then interest on any new purchases or balance transfers, etc. starts accruing from the date of the purchase or transaction. Receiving a different card than the one applied for. The promo may offer a gold or platinum card with no annual fee, 2.9% intro interest rate and 10.9% fixed APR thereafter. But when your card arrives, it is just a "basic card" with a credit limit of $1500, an annual fee of $35 and an APR of 22.9%. Congratulations, you have been a victim of the asterisk * (* "with approved credit"). If you don't meet the card issuer's criteria (and only they get to judge what those criteria are), then you may receive a very expensive card. Decline the offer or cancel the account—immediately. Fees are the money-makers for the card issuers. These include monthly finance fees (interest), annual fees, balance transfer fees, cash advance fees, late payment fees, over-the-credit-limit fees, convenience check fees, and on and on. Study the fine print carefully for fees and terms related to those fees. 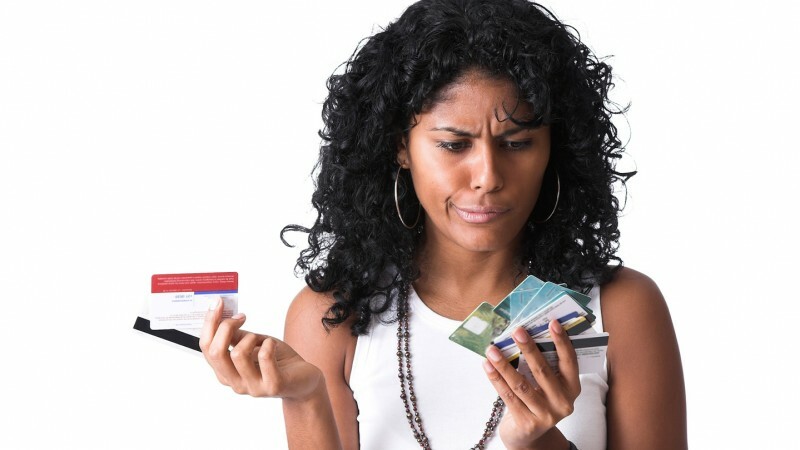 Too many credit cards will ruin your credit before you really have credit! Don't be the sucker many financial institutions think you are... slow down, stick with one credit card, and listen to your good sense, not the hype. Flipping Money Scams on Social Networks! Do You Use Prepaid Cards? Then Read This. About to Buy a Smart Home or Install Smart Technology in Your Current Home? Amazing New Ways to Buy a New or Used Car! Worried About Your Kids and Money? "The FoolProof Foundation believes there is a fundamental flaw in the teaching of financial literacy." How we have put your generously donated funds to work. This website is powered by the FoolProof Foundation. Our mission is to teach consumers the importance of using caution, questioning sellers, and relying on independent research before spending money.